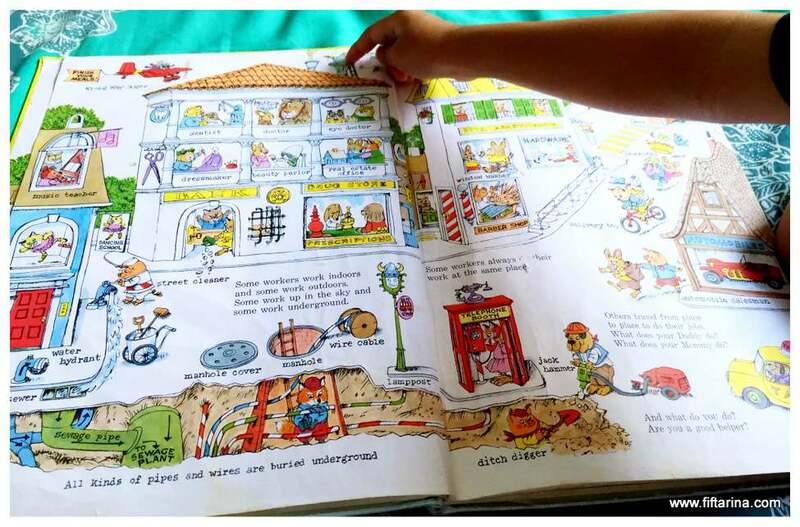 We love Richard Scarry’s book. We love the beautiful illustration and his wonderful details. 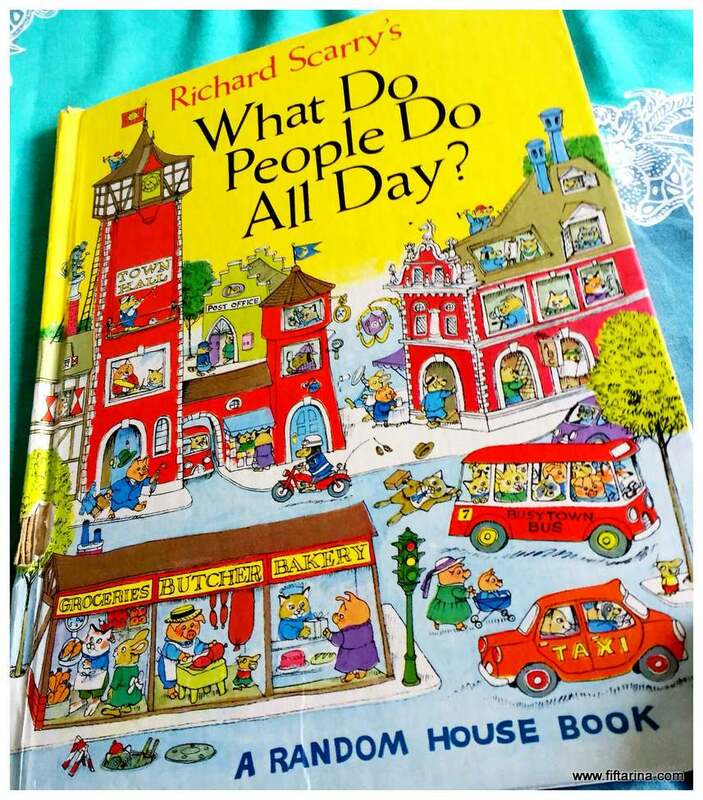 Among our Richard Scarry’s collection, the one that gets read the most is What do people do all day. This is an all time favorite children book in the house. There were time where Abdurrahman would get this book out from book shelves every single day, and ask me to read from page one, or even, from the book cover. 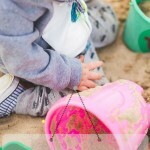 It is that interesting, for children, and even for us, the adults. Unlike some other children book that offers big picture and minimal text, this book contains massive pictures in every page, in full colors, with a nice short description on what’s going on there. 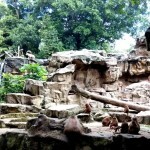 I would say, it’s something like a little encyclopedia for the kids using animals as the main characters. So, welcome to the world of Huckle (the cat) and Lowly (the worm). 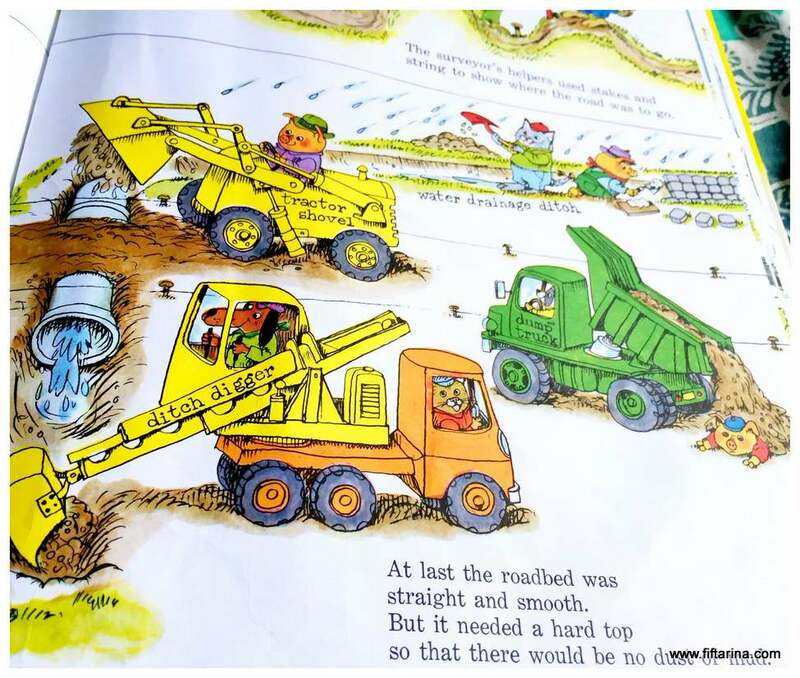 This book starts with introducing the concept of occupation to children, that every one is doing some work in a particular place, be it inside a building, constantly on the move (like a delivery boy), down under the road (just like construction worker), or even up in the sky, like a pilot. When they complete a job, they earn some rewards (in most cases, money). But this book explains too that a good child gets reward for being a good helper at home (what a nice way to encourage kids to help us *wink*), and mommy also gets rewards too, for keeping the house tidy and neat as well as raising the children well. Then it goes on to tell us that some of the money earned is spent for daily necessities like food, while the remaining can be used to buy extra things like prizes and surprise, and the rest is kept in the bank. Cool, right? I could not imagine how I can explain this financial concept to my children easily, but with this book, it is as easy as pie! 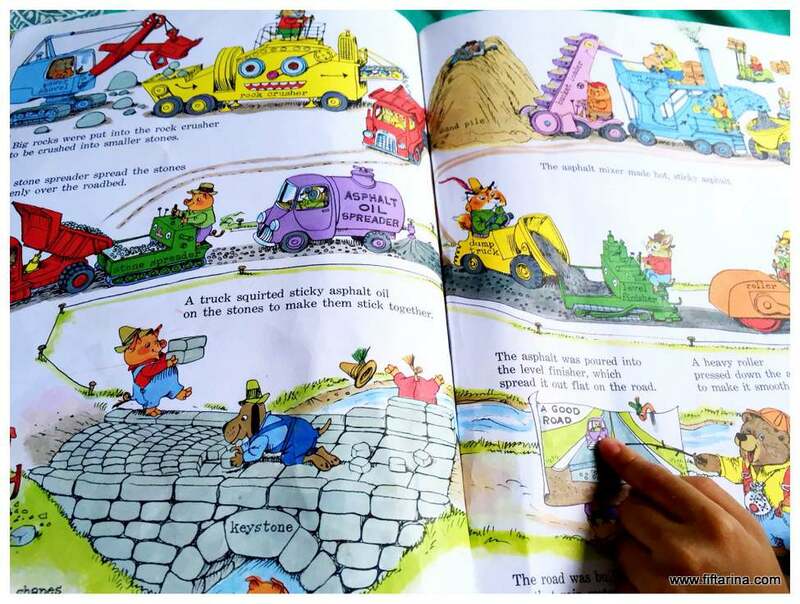 Then, the book continues to discuss the details of different occupations in a separate sub stories, in a very child-friendly manner. Take for example, the story of Fireman to The Rescue, where the firemen come to rescue him. Again, what I love about this book is that it explain even the tiny little details. It illustrates how Huckle’s neighbor presses the fire button, which activates the fire alarm in the fire station, and based on the location identified by the alarm, a group of fire engines quickly whoosh up to rescue Huckle’s house from fire. 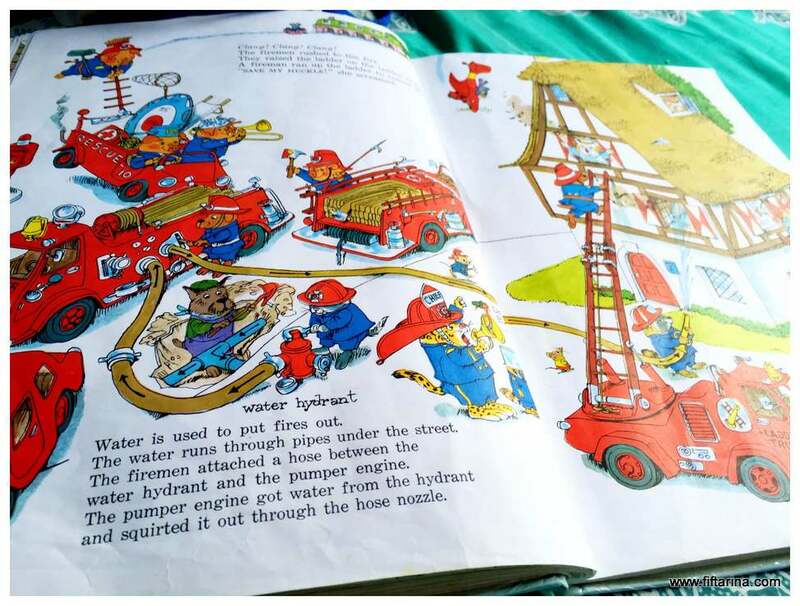 It also shows how the fire engine gets the water from (that’s the function of fire hydrant), and what are the tools being used by the firemen. So really, we absorb a lot of knowledge even from one story. 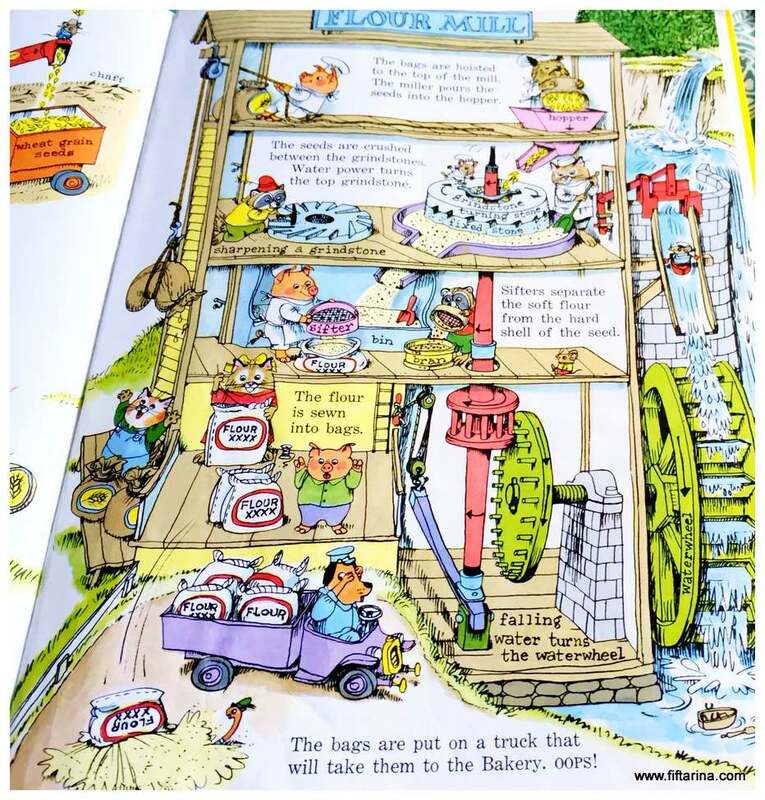 Some of our favorite stories include Where bread comes from, which features how wheat is processed, starting from harvesting a field of wheat using a giant harvesting machine, make a wheat flour in a flour mill, from grinding, separating the flour and the hard shell of the seeds, putting the flour into the sacks, then use the flour to make yummy breads in the bakery. 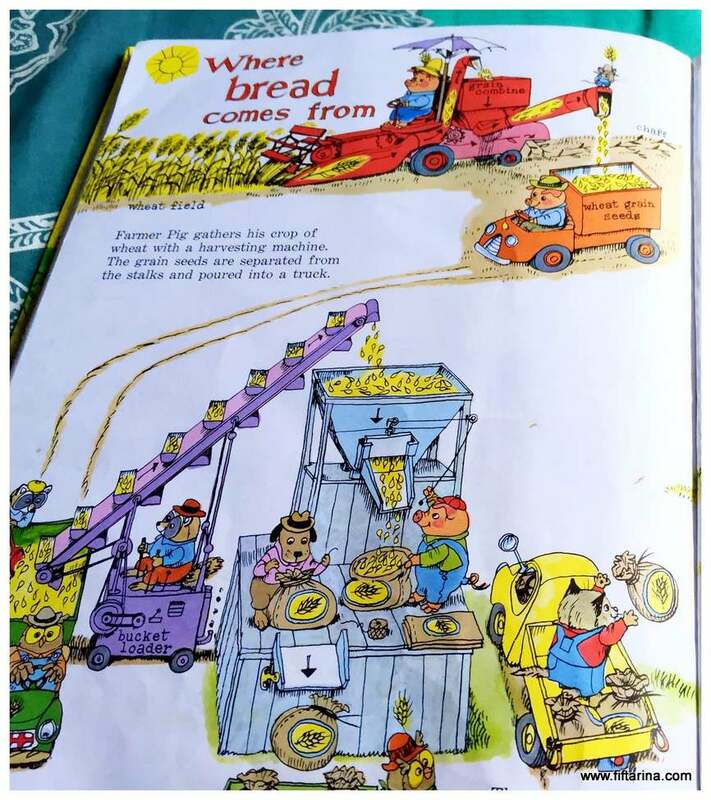 While the processing explained in making flour might be outdated (such as using water-generated grinder to grind the wheat), the concept is there and is very easily digested by the children. Where do bread comes from? Building a new road is also one of Abdurrahman’s favorite. The story starts from how the road between two neighboring towns has been deteriorating so much such that the two town leaders decide to make a new one. From flattening out the road, putting the rocks, gravels, asphalts, as well as the importance to make water drainage, putting lamp posts and signs to show directions, everything is explained in clear detail on how to make a good road that is safe for everybody. There are still many other stories inside this book that surely will captivate your children’s attention, such as the train trip, a voyage on the ship, how the seeds grow, and more. All in all, this is an incredibly excellent book to have. So wait no more, grab your own copy of What do people do all day from Amazon now. 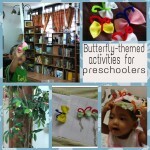 Or here, if you prefer to purchase from Book Depository.com. Tips: if you are looking for more affordable price option, try second hand option in Amazon website. We got ours this way, and I could not spot any imperfection, it’s just like new! Did you enjoy this article? 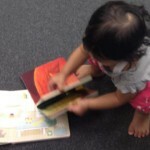 You may be interested in how to raise little book lovers.